Hear my cry, O God, listen to my prayer; from the end of the earth I call to you when my heart is faint. Lead me to the rock that is higher than I, for you have been my refuge, a strong tower against the enemy. Let me dwell in your tent forever! Let me take refuge under the shelter of your wings! For you, O God, have heard my vows; you have given me the heritage of those who fear your name. Prolong the life of the king; may his years endure to all generations! May he be enthroned forever before God; appoint steadfast love and faithfulness to watch over him! So will I ever sing praises to your name, as I perform my vows day after day. 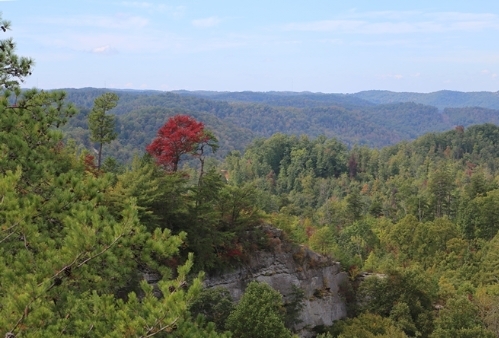 Red River Gorge, Daniel Boone National Forest, Slade, Kentucky. This entry was posted in Uncategorized and tagged Daniel Boone National Forest, Kentucky, Red River Gorge by Todd D. Nystrom. Bookmark the permalink. Great to see you posting again. I’ve been following your friend who is blogging about hiking the AT with great interest. God bless you! Thanks for the encouragement, Matt. Between the daily busyness of life (work, family, etc.) and the new responsibilities I have taken on in my church, I know my posts will be sporadic, but I hope to get something out more often than I have been lately, even if it is something simple. Dr. D’s AT thru-hike has certainly been an inspiration! It even has my wife pondering the idea of us doing some section hiking on the AT someday when time will allow.